UDM Downloads > Mobile ImageDraw by Neodynamic! ImageDraw is a server control which generates real time on-fly images for ASP.NET Mobile Web Applications. ImageDraw allows you to use all the potential of GDI+ in your ASP.NET Mobile Web Applications. You can use ImageDraw to deliver real time dynamically generated images such as charts, diagrams or any other graphical application. ImageDraw also can be used to replace the Image Mobile WebControl built-in .NET Framework. You will not have to create, never again, an image file for each image format supported by mobile devices. ImageDraw can render an image file (*.wbmp, *.gif, *.jpg, *.png, *.bmp, *.ico, and *.tiff) to the image format preferred by client mobile device. ImageDraw doesn't require any special or complex configuration to use it in your Mobile Web Applications, just drag & drop ImageDraw on your Mobile WebForm. You do not need to do any of the following things: - Create an image file in different formats and sizes , i.e. YourImage.GIF, YourImage.JPG, YourImage.WBMP, etc. 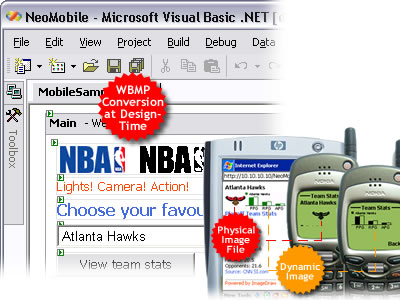 It is the implementation that uses the Image Mobile control built-in .NET Framework. - Write device filters into the <DeviceSpecific> tag. - Grant the ASP.NET account write permissions to some server folder (Security Risk) - At design-time ImageDraw shows you the original image with its WBMP conversion. The Neodynamic WBMP Utility allows you to preview WBMP conversion of an image file, and the Neodynamic GDI+ Preview allows you to preview a GDI+ Bitmap object. Enter at http://www.neodynamic.com from your mobile device and see this product in action.